Carlsen Receiving Hoppers- Made in the USA! 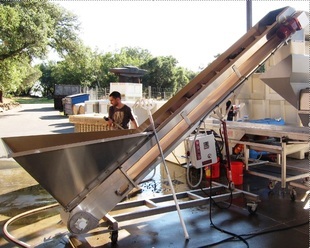 The key to better destemmer performance, easier press loading, and less labor used while processing wine grapes. Write off the whole purchase price in year one while the equipment pays for itself! Get Financed in 24 hrs. Designed for dumping half- ton bins into on the fly, the Carlsen 6- Foot Horizontal Receiving Hopper is the key to best results from your destemmer. Height adjustments are made easily with supplied pockets to use with your forklift for use with other crush equipment. By supplying the destemmer with a specific flow rate of grapes, the operator can then dial in the perfect speed at the destemmer. In a hand- picked fruit scenario, this could minimize the need for sorting grapes. And it will save labor and increase the quality of the destemmed fruit that is accepted during sorting. Is it GENTLE on grapes? A horizontal, tight- fitting, flight edged, polished interior, over sized, contiguous- welded, seamless shaft auger is not harming the fruit. There is no pinch zone between the hopper floor and the screw. There is negligible, if any increase in solids using this hopper. The energy used to move the fruit is not wasted, as the bunches slide easily on the polished stainless interior of the hopper. This design is more gentle than hand- raking fruit out of a bin, into the destemmer. It is also much more efficient; And that saves labor. See more photos below of how nicely built this piece of crush equipment is. The hood opens. The shaft is seamless, flight edged, and has a solid weld with no gaps. Solids creation is at a bare minimum. A constant feed is supplied gently. 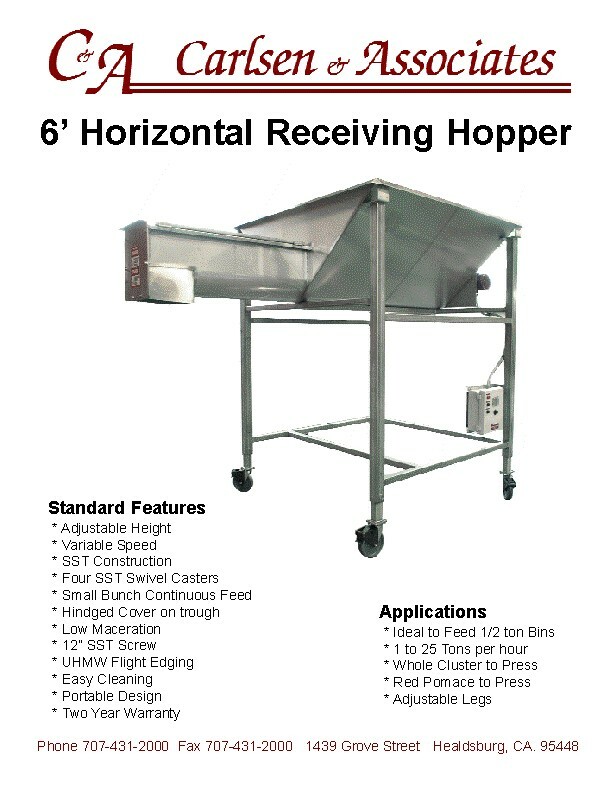 Discharge Height of the receiving hopper is adjustable from 65 to 105 inches on average. The auger in our Horizontal Receiving Hopper is flight- edged, seamless, contiguous welded, and SUPER GENTLE. Equipped with a manual hydraulic ram to raise or lower the discharge height. Cupped Belt Cleats- Hold Juice. The last word in gentle mechanical movement of grapes is our incline belt conveyor. It's variable speed and single or three phase power input make it very versatile and great for use anywhere there is a need to change the height of incoming fruit. This is not automated crush equipment or a labor- less system. There will be some care required to drop the correct amount of fruit into the intake.